Scientists from ITMO University and Lebedev Physical Institute of the Russian Academy of Sciences proposed a new microwave antenna that creates a uniform magnetic field in large volume. It is capable for uniform and coherent addressing of the electronic spins of an ensemble of nanodiamond structure defects. This can be used to create super-sensitive magnetic field detectors of a new generation for magnetoencephalography in the study and diagnosis of epilepsy and other diseases. The results are published in JETP Letters. Studying the magnetic field characteristics is necessary in many industries: from navigation to medicine. For example, magnetoencephalography can register magnetic fields arising during the operation on the brain, as well as measure the activity of individual neurons. This method is used in the diagnosis of epilepsy and Alzheimer's disease, or in preparation for operations on the brain. However, magnetoencephalography requires super-sensitive magnetometers: devices recording the characteristics of magnetic fields even if they are very weak. Therefore, scientists are constantly looking for new ways to create super-sensitive magnetometers of the new generation. Such devices should operate at room temperature and low input power. Moreover, they should be compact and relatively cheap. One of the promising options in this field is nanodiamonds with defects. The nanodiamonds are carbon nanostructures with a high refractive index and high thermal conductivity, which almost do not interact with other substances. They may contain complex defects of the internal structure, such as Nitrogen-vacancy (NV) centers. "Such defects may be created artificially: when a carbon atom is removed from the diamond's crystal lattice, the resulting vacancy is bonded to the implanted nitrogen atom. The structure of this defect is unique since the electronic spins of the individual center are manipulated by electromagnetic fields. Depending on the properties of the surrounding microwave magnetic field, the state of the electron spin of the NV-center is changing, and this can be recorded with optical methods," explains Dmitry Zuev, researcher at the Physics and Technology Faculty of ITMO University. However, as the response of single NV-center is not strong enough, an ensemble of such defects are necessary in order to improve the sensitivity of sensors. This is where a problem arises since the reaction of the electron spins of all the centers in the nanodiamond must be coherently addressed and manipulated. In other words, they must all be in a microwave magnetic field of the same intensity so that their response can be the same. Scientists from ITMO University and Lebedev Physical Institute of the Russian Academy of Sciences suggested using a dielectric microwave antenna to coherently control the electron spins of NV-centers in the whole nanodiamond volume. 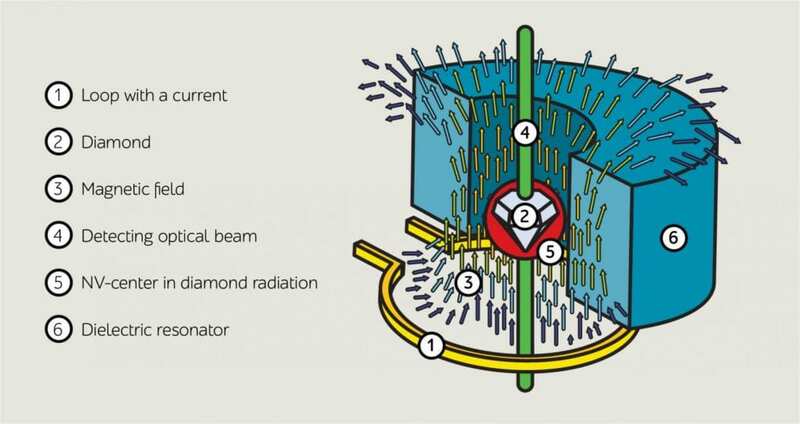 The antenna is represented by a dielectric cylinder with an internal hole containing nanodiamond with many NV-centers. This system is excited by an electric current. Once an input power about 5 watts is applied, the dielectric cylinder creates a strong uniform magnetic field around the nanodiamond. As a result, the electron spins of all the NV-centers are synchronized in the same way and thus provide a high magnetometers sensitivity. "The main challenge of this work was to achieve coherent control of the electron spins of NV-centers in the entire volume of the commercially available nanodiamond sample. We decided to use an antenna based on a dielectric resonator for this. We calculated the required antenna parameters and estimated the expected effect. Experimental studies were conducted in collaboration with the research group of Professor Alexey Akimov in Moscow. We collected an experimental sample and measured the Rabi frequency, which shows the frequency with which the electron spins can be manipulated. The larger this value, the better. We got a Rabi frequency of 10 megahertz. Such a result was never experimentally shown for a volume sample before, so this is actually a breakthrough," said Polina Kapitanova, researcher at the Physics and Technology Faculty of ITMO University. Measuring the Rabi frequency is the first step towards determining the sensitivity of the new magnetometer. Scientists plan to continue experiments and theoretical studies, searching for new antenna configurations that will provide even higher quality magnetometers.